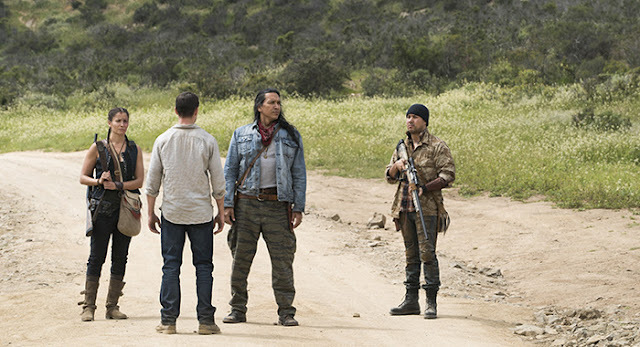 Fear the Walking Dead introduced Michael Greyeyes, a Native American warrior with a long-standing grievance against the Broke Jaw Ranch that's finally boiling over. He was the one who shot down the helicopter and killed Travis (Cliff Curtis). "Have you lost your mind, Walker?" said Troy. "Have you any idea what you've just done?" "Defended our land," Walker replied. Walker explained that the bad blood between him and McCarthy, the guy who got his brain-can opened, went way back, and McCarthy killed two of his men yesterday. Troy almost passively insinuated that Walker had started a war, or at least condemned himself to death, but then Walker revealed that his men had the Broke Jaw soldiers surrounded. He ordered the Broke Jaw soldiers to turn over their guns, vehicles, supplies and boots and hoof it back to Broke Jaw to tell Jeremiah (Dayton Callie) what happened. "Tell your people it's time for justice," he said. "The land you've lived on needs to be returned. Abandon the ranch." Troy said no on the basis of having sacrificed too much to secure the ranch and Walker was like "oh, you're gonna talk to me about sacrifice, pinkeye?" Madison stood up and demanded water. Walker told her she bought into a lost cause by joining the survivalists, and she replied that she bought in when he shot down that helicopter, taking one of her people. So now Madison has yet another enemy, now that things with Troy are really bad (he held a knife to her throat while she slept later in the episode). 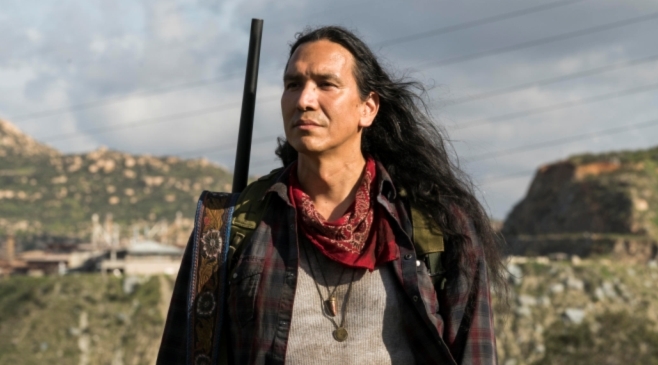 Responses to "Michael Greyeyes is Fear the Walking Dead's New Native American Antagonist"